Ronald Bussink of Switzerland designed this "London Eye" of Cape Town. It is being erected at the N1 entrance to the Waterfront. These photo's were taken today of the Big Wheel. It looked like a giant Pac-Man biting Cape Town. At about 13h35 I arrived back and the circumference was complete. I will try post daily pics of the progress during the last 10 days until the World Cup kick-off. I will refer to our resident Ferris wheel as "wheel" throughout this post. IOLTravel.co.za released pertinent details of the "big wheel" that I found most informative. The wheel will remain here for 6 months under a contract approved by the city. It is approximately 60m high, in comparison to the London Eye which is 135m in height. The cost will be about R70.00 a ride. Each ride lasts ±20 minutes with panoramic views of Table Mountain, Robben Island, Cape Town Stadium and the Paarl Mountains. Various pricing packages for families etc will be available. 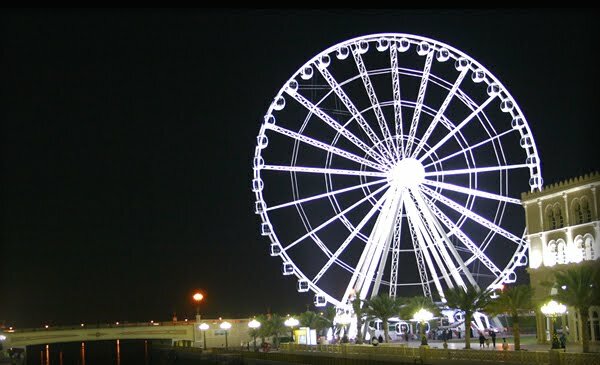 On the right is what the completed wheel should look like, at night. 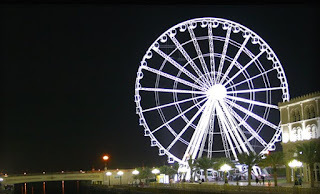 "The wheel has 36 enclosed air-conditioned capsules holding eight people. Each trip accommodates 288 people. Running daily from 10am until 10pm (with the possibility of extending running hours until midnight), the wheel could accommodate 15 000 riders a day. At night it is lit up by 2 million LED lights, which consume only two kilowatts of energy an hour." For the "lanies" there is VIP cabin for a price with leather seats and a Champagne bar. Perfectly situated at the CBD entrance to the waterfront, near the CTICC with the canal running alongside. There will be two cabins accessible by wheel-chair and I think they will probably use the paved area on the side of the wheel as parking. Click to enlarge pics. More updates will be on the way, although I am sure more press will be released on this in no time. Can't wait to go for a ride on our Cape Town Wheel. Looking really good at night pushing out all 2 million LED lights. Below on the capsule/tube/bubble/eyeball or whatever you wish to call it, says "wheel of excellence". When standing from a distance it does not seem that much higher than the buildings surrounding. I am still excited, because I think the advantage of being 60m high in that position will be unique! So I finally went for a ride on the 11th July 2010, Soccer World Cup final day. Turns out tickets are R80, but I enjoyed it. About 4 rotations and for R150 you can buy a nice picture set at the end. Glad I can now say I have done it. Enjoy! It was "unique" being up there and experiencing it. Will be cooler driving past it now, knowing what its like. You have about another 5 months to go for a ride, if you haven't already! Check out my full AdsMitchell photo set. it looks so awesome. saw it yesterday morning. Irma - Thank you, yes R70 is not too bad at all. Do I have to share with strangers? I agree Irma, R70 is'nt too much to ask for. 20 minutes sounds worth it for sure..
Yikes, even at half capacity they're looking to pull in R525,000 a day. Not bad. Couldn't rea-he-heally cost that much to put up. Nice income for whomever won the tender, or backhanded for the rights. I'd be very interested what the end costs were. wondeful!! but already causing traffic flow problems!! im going this saturday!! YAAY!! can.not.wait! Cape Town for the win!! no wait... SA for the win!! Danielle - that is awesome! We are still winners as hosts, yes. If you would like to send me some pics of your trip on Sat, that would be great. I could try add them to this post. I'd be glad to send u the pics... i hope we have good photo weather!! i wanna get some sky high scenic pics!